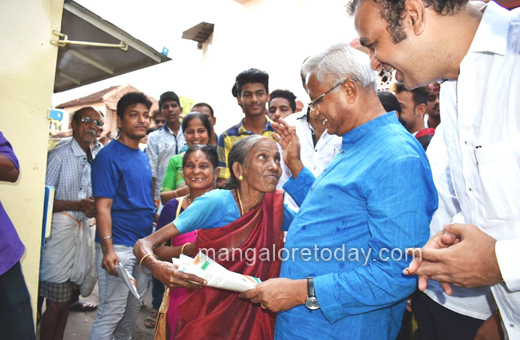 Mangaluru, April 29, 2018: Mangaluru South MLA and Congress candidate J R Lobo campaigned in Carstreet, VT Road and Ganapathi Temple area on April 29, Sunday along with his supporters. He made a door-to-door visit and handed over pamphlets highlighting the achievements of the party as well his contributions as an MLA for the past five years. Earlier, Lobo visited the Sri Venkatramana Temple, Sri Lakshmi Narasimha, Mutt, Sri Katyayani Mutt and Sri Parvathi Acharya Mutts in the area and offered prayers. Speaking to media men on the occasion, Lobo said several roads of his constituency have been concretised and several arterial roads too have been developed on a priority basis. He also assured that he will always live upto the expectations of the people. Block Congress President Vishwas Kumar Das, Corporator Ramdas Prabhu and several party workers and leaders were present.